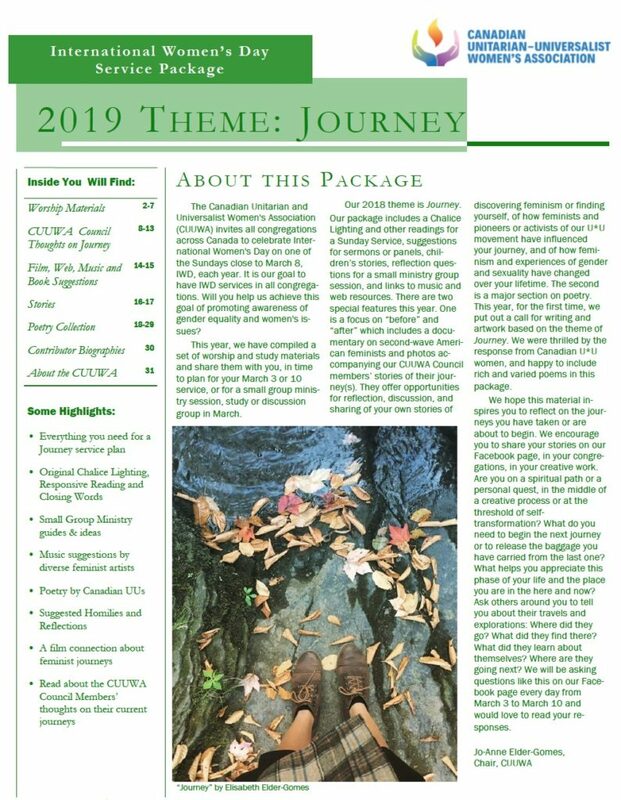 The Canadian Unitarian Universalist Women’s Association (CUUWA) is a UU women’s organization with specific goals: to raise awareness about women’s history, rituals, and perspectives, through training, communication, celebration and many resources. The full mission statement and vision can be found on our About page. The 2019 International Women’s Day Service Packet is now available. Our theme is Journey! The 2018 Annual Gathering in Hamilton on May 20th was a superb event. Check out the details. Visit the CUUWA Facebook page – it is public so there is no need to be a Facebook User. Feel free to post articles of interest to all. Our Resources page has ideas and inspiration. If you are planning an International Women’s Day service, there is a special section. The CUUWA brochure is now posted under About Us. The CUUWA is associated with the Canadian Unitarian Council.